BPSC 63rd Notification 2017 – BPSC 63rd Notification, Exam Date, Online Application Form: Apply Online for 355 Bihar Civil Cervices vacancies through BPSC 63 Exam 2017. Looking for 63rd Bihar PSC Notification? Bihar Public Service Commission (BPSC) 63rd Common Combined Examination is to be announced. BPSC 63rd notification has been prepared and to be published on official website soon. 63rd BPSC Notification is out. The Bihar Public Service Commission (BPSC) is all set to announce notification for BPSC 63rd examination. Written examination for BPSC 63rd will be held in 2018 next year. Here is everything you need to know about BPSC 63rd Examination 2017. Bihar Government will conduct Bihar Public Service Commission (BPSC) 63rd Common Combined Examination exam this year for various B Grade Officers vacancies in various Department of Bihar. We are going to provide you complete details about BPSC 63rd exam such as notification, advertisement, exam schedule, exam date, online application form, syllabus, exam pattern post details and more right here on w3i.in. The Bihar Public Service Commission (BPSC) is to recruit 355 vacancies through 63rd Common Combined Main Examination. Online application for filling up above mentioned vacancies will be available from 2nd week of November. 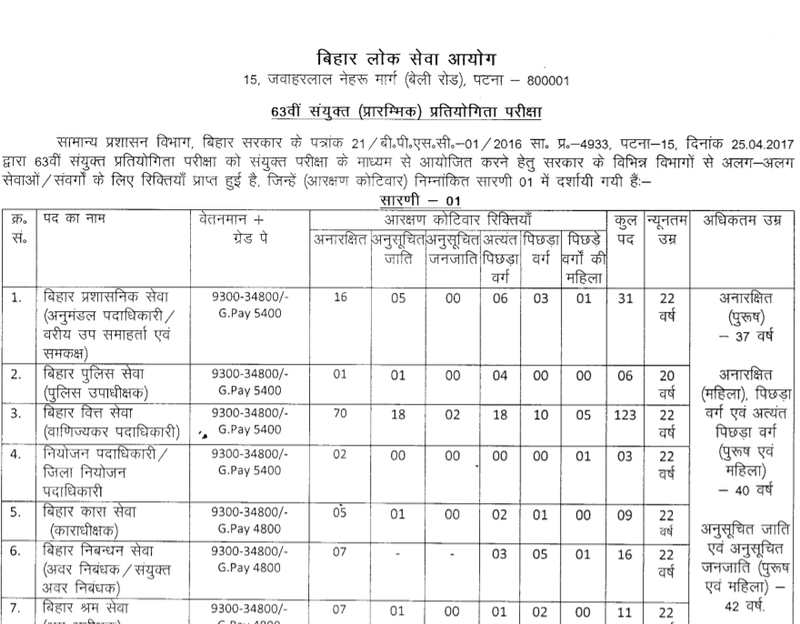 Apart from various other vacancies, there are 31 posts for Bihar Administrative Services, 123 posts for Vanijyakar Aayukt to be filled by BPSC 63rd recruitment notification. Candidates with Bachelor's degree is only eligible to apply for BPSC 63rd Preliminary Exam 2017. General graduate candidates are not allowed to apply for BPSC 63rd 2017. Since last few months, there were rumours that BPSC 63rd exam is coming this year. Finally the much awaited BPSC 63rd notification is all set to be announced this week. Bihar Public Service Commission (BPSC) is speeding up recruitment drive for 63rd civil service exam. The process of filling online application form would be start in November 2017. If you are looking for detailed information about 63rd BPSC exam about notification, exam dates, online application form, how to apply online and other details, read our next posts.